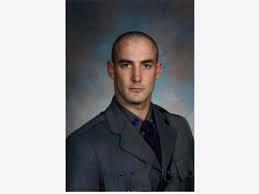 Trooper Nicholas Clark was shot and killed when he and other officers responded to a suicidal subject at 10041 Welch Road, in Erwin, New York. He had responded to the residence, along with members of the Steuben County Sheriff’s Office and Corning Police Department, after the man’s wife called 911 at approximately 3:30 am and reported that he was suicidal and possibly armed. Crisis negotiators were attempting to make contact with the subject when he opened fire, fatally wounding Trooper Clark. The subject was found deceased a short time later suffering from a self inflicted gunshot wound. Trooper Clark had served with the New York State Police for just under three years. He is survived by his parents and brother. He was a former two-time high school state wrestling champion and had previously tried out for the Buffalo Bills football team.